A side effect of having a growing business is the requirement for larger storage areas. Unfortunately the more space you have, the harder it becomes to find what you need. 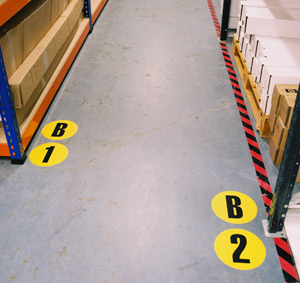 A great way to combat this issue is to clearly label the aisles of racking in your warehouse or stockroom. 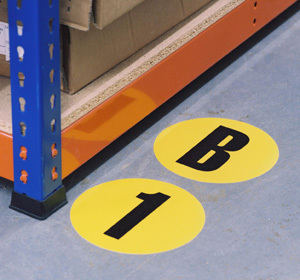 This can easily be achieved by using these high visibility floor ID markers supplied in either letters or numbers, helping your staff members to quickly and accurately find specific storage areas. The floor signs feature an aggressive permanent adhesive which will stick securely to most smooth floor surfaces. The material of the ID marker is hard wearing and slip resistant to withstand warehouse and factory traffic. Note: For best results please ensure the flooring is clean, smooth and dust-free before applying the signs.